I find myself taking a lot of screenshots, especially for things like documentation, sharing information or simply recording information on-screen. 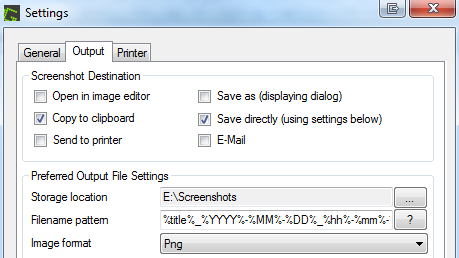 In the past I’d printscreen or use alt+printscreen (captures the active window), paste it into paint.net/paint, adjust as needed and save. Whilst this method certainly worked it was a bit clunky and didn’t always provide the most professional looking screenshots. Introduce Greenshot. I was a bit unsure how helpful this application would turn out to be, but I can say after a few months of using it- wow! It’s a great time saver and increases the quality and ease of taking screenshots. Once the program is installed the Printscreen key defaults to selecting a region, which is great- I rarely need to take a screenshot of my entire screen… especially as I have dual screens in most places. You can of course capture the entire screen if you like with Ctrl + Printscreen, or if you’d like to capture the active windows alt + Printscreen also works. There are various ways to output the image, including different image formats. My personal preference is to copy the image to clipboard and save it directly to a screenshot folder. Greenshot also includes it’s own inbuilt image editor, which includes annotating, highlighting or obfuscating parts of a screenshot. Great program – Thanks for posting this!